Beat this, a pig on a mission has foreshadowed better times for the genus Sus, within the even-toed ungulate family Suidae. 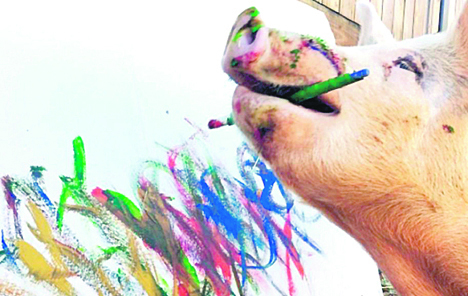 One such pig has made sweeping waves in the art world with a mission—the pig who loves to paint, also known as Pigcasso, is starting to literally hog the limelight in the fashion world, too. The name is apparently after Pablo Ruiz Picasso, a Spanish painter, sculptor, printmaker, ceramicist, stage designer, poet and playwright who spent most of his adult life in France. Having had the pig’s artistic talents nourished by South Africa’s Farm Sanctuary where she was rescued as a piglet, Swatch Watches commissioned a design by Pigcasso and it’s become their best seller. Sources said the sow was rescued from an abattoir as a piglet and brought to an animal sanctuary in Franschhoek, in South Africa’s Western Cape region in 2016, where her new owners noticed her love of color and paint brushes. From pork chop to the heralded headliner, Pigcasso is on a mission, observers have noted, to paint a better picture for the planet and is giving connoisseurs the opportunity to invest in a masterpiece—and they say that’s no hogwash either. They added every original Pigcasso is personally signed by her nose-tip and all limited edition prints are sold with a certificate of authenticity.